Long before ThomaStudios opened in 1984, private instruction was a mainstay. JD Thomas began giving private lessons to students while in college and continues to this day. ThomaStudios is located in West Linn, Oregon, southwest of Portland. However, lessons take place in the student's home, which not only makes it very convenient for the student (and parents), but it also creates the best possible learning experience. Taking the lesson in a familiar environment, and on the same instrument where you practice, helps keep the atmosphere relaxed and fun. ThomaStudios is currently adding students in West Linn and Lake Oswego, Oregon. With a past and present student clientele that ranges from age 4 to 77, ThomaStudios enjoys a vast diversity in student interest and experience. 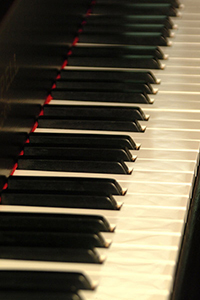 Specializing in one-on-one piano instruction, ThomaStudios stresses basic fundamentals first: reading, rhythm, technique, and ear training. Once the basics are under way we can venture toward more advanced harmonic studies: chords, their use and function within tonalities, accompaniment, improvisation, and beyond. The material and repertoire is customized to the interest and ability of the student. While traditional music, including classical, is used, the student is also exposed to more contemporary popular music as well. Much of the material used in the lessons has been been developed by ThomaStudios, written and re-written as needed. It is designed to compliment all of the core books used in the lessons. In fact, new material is being developed every week based on experiences and ideas that arise from working with students. While much of the basic material is constant, no two students learn the same way nor at the same pace. If the need arises to address a particular need or situation with a student, new curriculum material is developed and written to accommodate it. This approach allows the curriculum to stay in touch with students' needs and interests, and maintains a fresh approach to the teaching and learning experience. 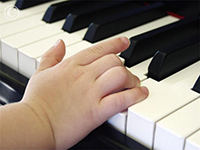 Learning to play piano has been linked to development in brain activity and learning ability impacting every aspect of life. You exercise both hemispheres of the brain, learn to use both hands independently, and increase your powers of concentration. Give your children or yourself the artistic stimulation and appreciation needed to use both sides of your brain effectively, and begin the journey creating a life-long skill that will carry on through one's entire life. Call or email ThomaStudios today to discover how fun and easy private lessons are when you don't have to leave your home for piano instruction. It doesn't get any easier; simply contact JD. He is always there to help. You can also fill out the convenient online form.